nanopod: Hybrid Studio re-opens September 22nd! 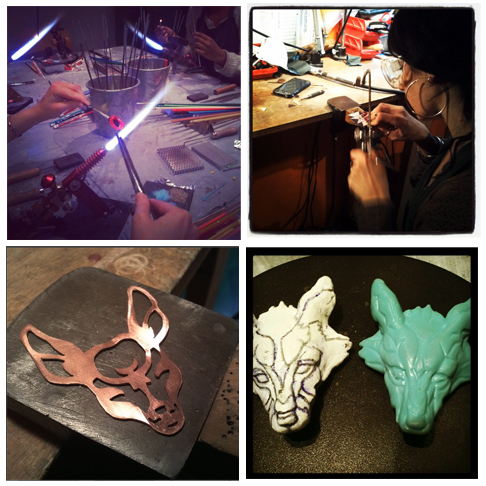 Providing space for artists at all stages of their careers to create, and explore new & continuing work in metal & glass! 8 week Metal + Glass (Next course starts up Monday, September 22nd Form • Fabricate • Cast • Fuse Learn basic Goldsmithing + Lost wax casting glass 6:30-9:30pm, 8 weeks, 1 evening per week Monday evenings $280 per person, 6 people max, 3 people min. $100 deposit necessary to hold space. evening #1: First evening: working with copper-safety, drilling, sawing, fold-forming. 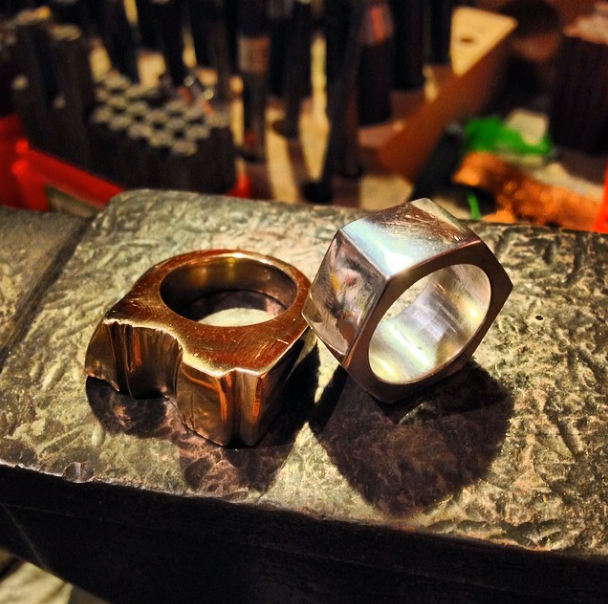 evening #2: Making a band ring out of silver (stamp, hammer finish, roller print, etc.) evening #3: working with wax create pieces w/the lost wax technique- to be cast in Sterling, Brass or Gold. 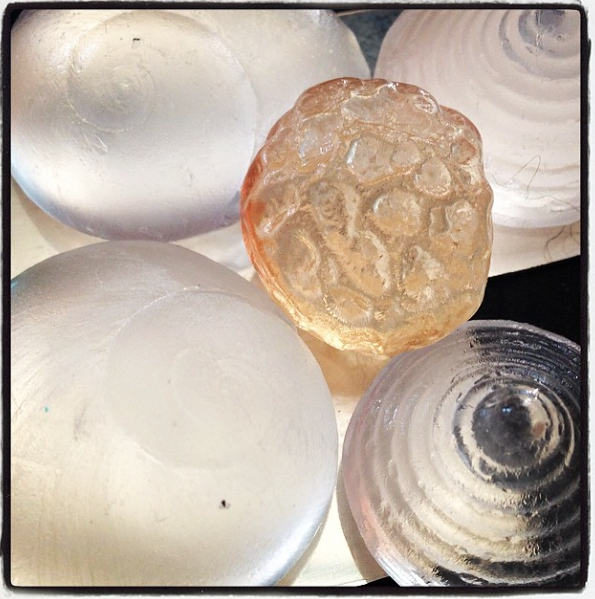 evening #4: Finishing wax projects, cleaning up castings> cuttlebone casting (finish up models) evening #5: NEW: Glass Casting- basic/simple mould making and casting a glass object to use in your jewelry! evening #6: bezel settings and tab setting for cabochon stones and your glass work. Clean-up glass & metal castings evening #7: Enameling copper projects, forming, how to make your own findings. evening #8: finish up projects No experience necessary! Copper, wax, glass, and some sterling silver are supplied. A list of local suppliers is included. Questions concerning this course? Please see our FAQ’s check out some past student work! Metal 2 – Lost Wax Casting Interested in casting your own wax models? Thursday evenings, October 2nd Lost wax casting runs 5 evenings at $180pp plus $130 lab fee (includes wax and 2 ounces of Sterling silver casting grain) Design, sculpt and carve a 3-dimensional ring, or pendant then, learn how to invest and cast your wax in Sterling silver. Finishing your castings through sanding, filing, and polishing. Ars Vitraria Experimentalis : Glass casting workshop October, 10th start/intro 6:30-9:30pm then Saturday 11, 18 and Sunday 12, 19 10am to 5pm, and Friday evening Oct 17th 5 Student max., 3 student min. $500pp Deposit of $200 to hold space. Glass casting workshop (small to medium scale) Learn various methods for casting glass. From paper thin to thicker, lost wax models, metal inclusions, and more. Students will learn how to make moulds from existing objects using Alginate, as well as model new ones from clay and wax. Hand built moulds and box moulds will be made with various refractory materials. 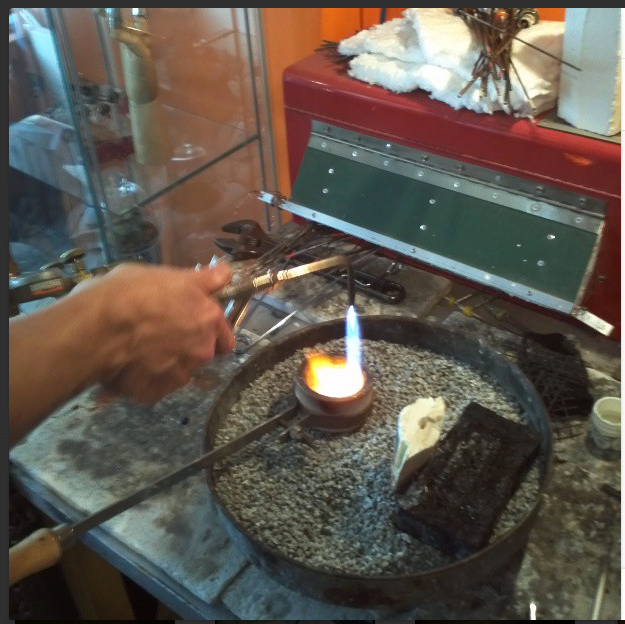 Students will learn different firing and annealing schedules for casting glass. And simple cold-working without expensive equipment! No experience necessary! All materials are included. Students are required to bring in their own half-face respirator with particulate filters. Aprons are available for use at the studio, as are all tools and equipment necessary for sculpting, firing and cold working glass, however, students are welcome to bring in their own tools, etc., just make sure your items are marked. 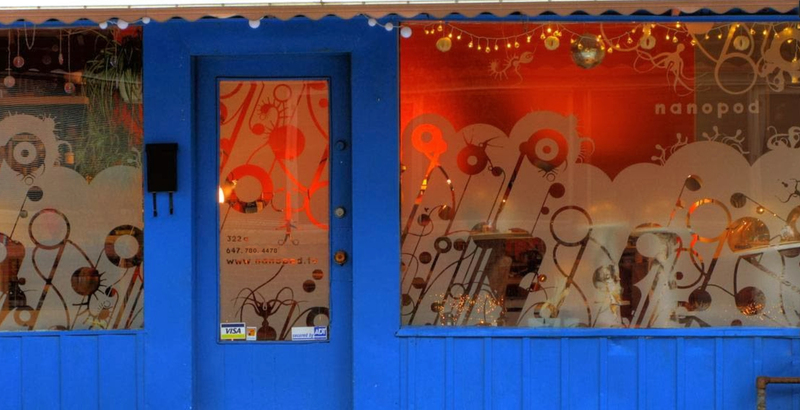 Fused Glass Components for Jewelry, Wearables & Functional items Friday 6-9:00pm, Saturday 10am – 5pm, Sunday 10am – 5pm (4.5 day workshop) 3 student minimum, 5 Student max., $325pp Deposit of $150 to hold space. Next class starts: TBA Fused glass (Kiln-glass) is frequently used in jewelry, but the emphasis is often on quantity rather than quality. In this class you will learn to distinguish your work through thoughtful design, careful studio practices, multiple firings, coldworking methods and, ultimately, good craftsmanship. Various glass c.o.e’s will be discussed, compatibility, annealing schedules, slumping and tack fusing. Instruction will cover creating glass jewelry elements for a variety of forms, functions and styles; working with pattern bars, Vitrigraph, stencils, etc. 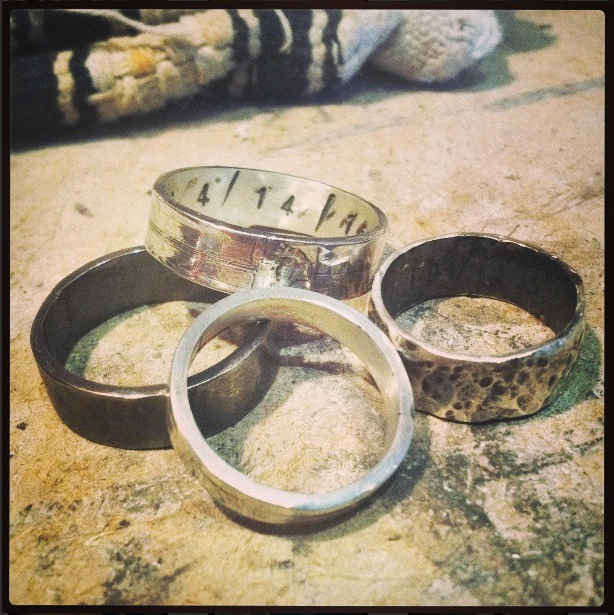 Sunday afternoon students learn how to bezel-set one of their glass pieces, and make a sterling silver ring band! Samples of and discussions about using kilnformed elements in jewelry applications or with other wearables will also be included, as will practical considerations such as studio setup and costs. All materials included. No experience necessary! Fire + Gravity Next course starts September 29th 2014 Sculpt with molten glass 6:30-9:30pm, 1 evening per week, 12 weeks $340.00 per person, 4 people max per course, 3 people min – $170 deposit required to hold space. 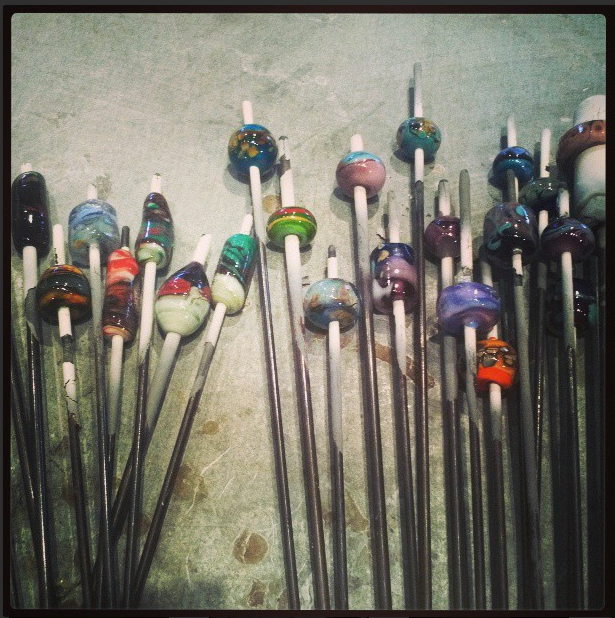 Focus on beginning mandrel wound glass beads. 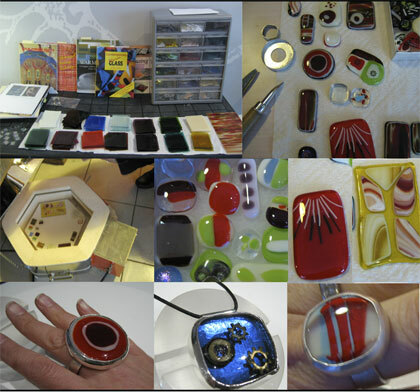 Working with beautiful Italian, Chinese and German hand-pulled glass students create beads, and rings. History is discussed, glass formulas, annealing cycles, glass suppliers/makers, and more! Create your own glass beads. Continuing where you left off the 1st day, learn how to sculpt different forms, rake, encase, make ‘twisties’, simple murrini, mix your own colours! Make hollow, florals, zebra & tiger striped beads, start sculpting! metal -in- glass! Using silver foil/leaf in your beads. Work with ivory glass, silver and clear, pull silvered ivory stringer. Add silver foil to other colours and see what happens! Start working off-mandrel. Warning: Off-Mandrel flameworking is addictive. 😉 Work Large! Create beautiful focal pieces, intergalactic marbles, and pendants. Demos include: Small vessels (small scale glass blowing), working with metal mesh, and more! All materials included*! No experience necessary! *Each student receives a special glass kit.